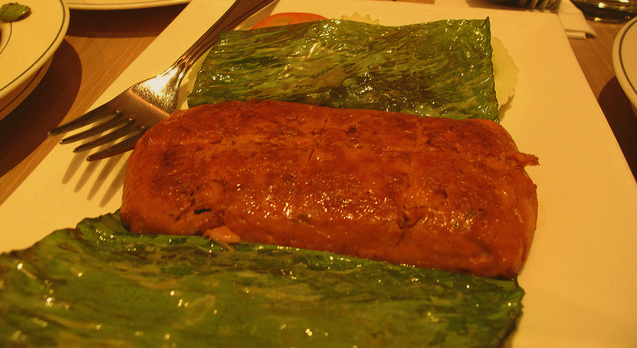 Otah (Otak-otak) wrapped in banana leaf. Made with Kurau (Treadfin) or Prawns, lemongrass, buah keras (candlenuts), turmeric, dried chillies, garlic, onions, roasted coriander seeds, grated coconut, coconut and laksa leaves. Boil all ground ingredients together with coconut milk and salt till thick enough to set. Then add fried pounded coconut. Mix well. Remove from fire and leave to cool completely. When cool, add fish or prawns (uncooked) and chopped laksa leaves. Place a little of the mixture in a piece of banana leaf, fold the two sides over each other and secure the ends with tooth-picks. Make as many bundles of otah as you can. Grill them over a slow charcoal fire for about 15 minutes, turning bundles when necassary. Serve hot with Nasi Lemak or eat it on its own.